Sometimes in the life of certain humans, there arise a situation in which the bones becomes weak and fragile. In medical terms, such condition is known as Osteoporosis. This condition occurs as a result of the loss of tissues accompanied with hormonal change, or lack of calcium of vitamin D. Just like the popular saying goes "prevention is better than cure", it is better to avert the occurrence of this unhealthy situation by adopting a healthy lifestyle. For some time now, many people are having the thoughts that osteoporosis is an illness for women only. That is not true, as men can get osteoporosis. 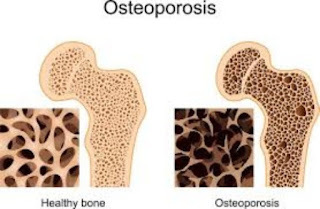 It is just that women are more prone to osteoporosis compared to men because their bone mass is lower to start with. To be on the right track against this disease, here are 3 simple steps to prevent osteoporosis and enjoy a healthy bone life. Men and women must ensure adequate calcium intake every day. The Health Promotion Board (HPB) recommends that adults aged 19 to 50 years old must consume an 800mg of calcium per day. It is equivalent to two cups of milk a day. Milk is not the only source of calcium for the human body. Other calcium-rich foods such as yogurt, tofu, anchovies, cooked spinach and kale are some of the many options. Minerals like magnesium and potassium are also a big help to build up calcium stores in our body. According to an online journal, superfoods to fight osteoporosis are the following: Milk, Cereals, Spinach, Broccoli, Cabbage, Fish, Banana, Prunes and Oranges. Avoid drinking too much coffee or other beverages with high caffeine content, as caffeine may decrease calcium absorption. Only a few people know that caffeine has high diuretic properties that eliminate calcium in a human's urine. This leads to calcium deficiency that may result in bone loss. Coffee, tea, and sodas are great examples of drinks that are rich in caffeine. Drinking no more than two cups of drinks that are rich in caffeine a day is suggested In addition, excessive consumption of alcohol prevents the human body's ability to absorb calcium.. Besides getting enough calcium for our body, it is also important for us to exercise regularly and be under the sun once in a while. Resistance training is another name for exercising your muscles using an opposing force. It is also great to prevent osteoporosis since it requires you to pull or push against resistance to build muscle strength. Vitamin D also plays a very important role in our body especially in preventing osteoporosis. Spend time out in the sun to help increase the absorption of calcium and vitamin D in your body. It can also makes your skin from ultraviolet light from the sunlight. If you are a very busy person and there is no time for you to play even a little time under the sun, it is just good to eat foods rich in vitamin D like egg yolk, fatty fish, breakfast cereals and cheese. In conclusion, try as much as possible to maintain a healthy bone, prevent osteoporosis by following these simple steps you have learnt to day.